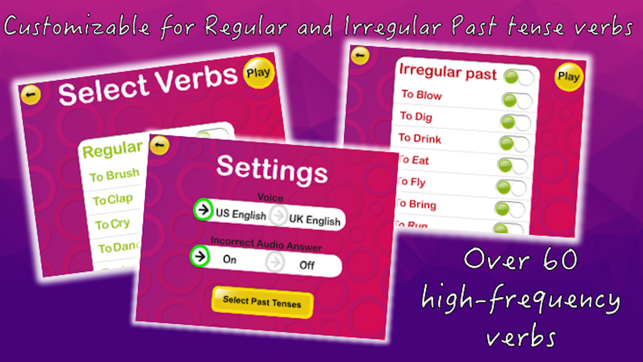 Created by Speech-Language Therapists/Pathologists with over 30 years clinical experience between them, Past Tense with Splingo is the latest app from the authors of the highly popular Splingo speech therapy apps series. 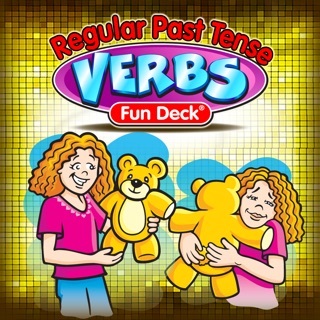 Past Tense with Splingo embraces children's natural fascination with technology and encourages engagement with language activities, allowing you to target specific language structures such as Past Tenses that can be difficult to address in play. 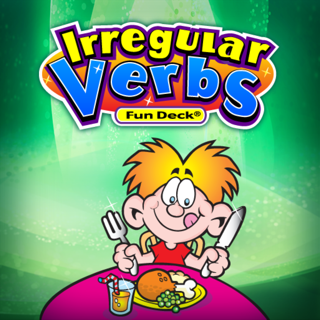 Over 60 verbs with Regular and Irregular Past Tense endings can be taught and reinforced through bright colorful images and entertaining game play. 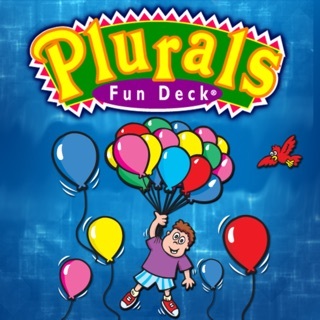 Splingo apps also have built-in, motivating reward games to encourage engagement. 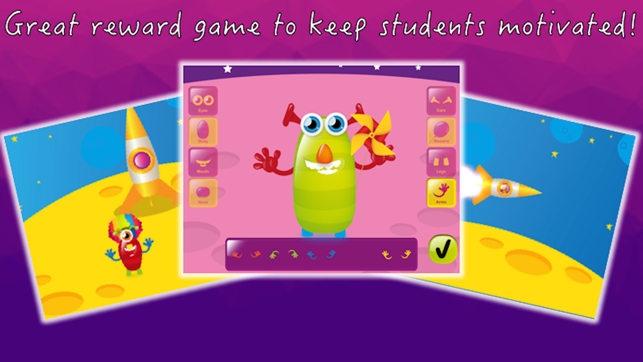 The reward game for Past Tense with Splingo invites children to create and build alien friends for Splingo! 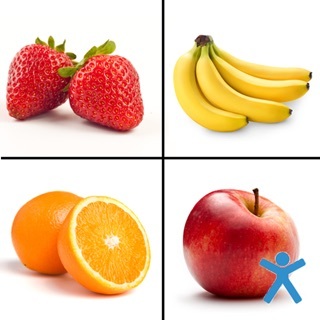 The app is fully customizable, enabling you to select specific verbs to target in therapy and teaching. 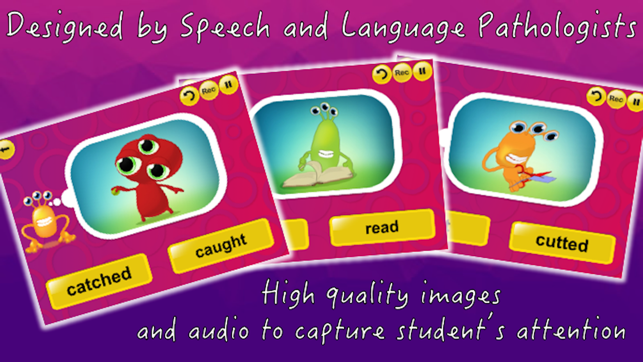 The app also has the option to select between US voice and UK voice and also has a Voice Record function that encourages children to practise using their own expressive language. 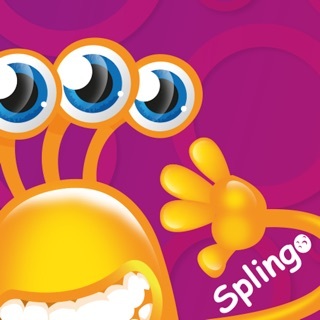 I really like the Splingo Apps on the whole—I should have looked over this more carefully. Using traditional flash cards SLP’s uses the “yesterday I.....(verb-ed.). This is that structure, only slower since you are not able to quickly move through each illustrated page. You can bypass a requirement to listen to the slow narrative. “Yesterday I ————-. Is that right?”by typing the correct answer four times, though I’d prefer to be able to turn the option on or off. Still the illustrations are engaging and there is a little reward game provided so you might want to purchase.